digital humanities – Gretchen Kreahling McKay, Ph.D.
Last year my institution, McDaniel College, entered into a consortium with nineteen other liberal arts colleges (SLAC) that are members of CIC: the Council of Independent Colleges. Thanks to the Mellon Foundation, CIC was awarded money to fund this project that examined new online models of education and how they might work in a SLAC environment. I was one of the two faculty members from my institution who taught a course fully online. My course was entitled Ways of Seeing Byzantium. My course was mentioned in a blog post by Bryan Alexander, who is a consultant on the project, helping faculty to find technological tools to support their pedagogical and learning goals for their online classes. You can read his post here. As he says, these are not "MOOCs"; if anything they are the antithesis. I will say this about my online class: I saw deeper engagement in the material because there was more time for students to think about their responses than the immediate and rapid fire expectation that a F2F discussion often requires. Even students who were concurrently enrolled in my F2F classes indicated to me that they liked the online class for different reasons, one of them being longer time to read, consider, and draft their comments. This coming spring I teach the course again, this time open to students at the other nineteen institutions. I'm looking forward to what those students will add to our discussions. A friend of mine sent me think link about a Digital Humanities project based at Stanford University by Professor Josiah Ober. This article explains the site and within the article is a link to the DH site itself, called POLIS. 1. A lot of the data that Ober is using was previously published. Ober is well-versed enough in the ancient Greek world to realize that if that very data were put in a new paradigm, different questions could be asked and new answers generated. From the same published data. I think that is very cool. 2. Graduate students helped enter this data. I don't have graduate students and I teach at a place that doesn't have Stanford's resources (to even put my institution and Stanford in the same sentence is nearing silliness). I am just about to embark on a digital project, but this gives me pause. I recall the gurus of my DH for Art History summer workshop, Sharon Leon and Sheila Brennan, noting that we should start small and keep the data "tidy," but I am still feeling rather daunted by what was done with POLIS. My own Italo-Byzantine painting site won't be nearly this large in scope - it's going to be an iconographic project and focused, for now, just on Tuscany in the thirteenth century. My main question: do people out there have suggestions for someone at the beginning stages of a digital project? It's been a year since I was actively engaged in building this website and thinking about the digital humanities. But there are several projects in the fire that have me back to this site and this subject. 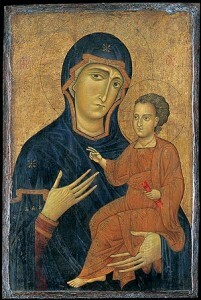 Berlingheiro, Madonna and Child, active in Lucca 1228, died 1236. Metropolitan Museum of Art, New York, New York. I would also like to figure out how to get some twitter feeds on the blog, and will continue to research how to do that. Hope the site is a bit better than it was.